An Air Transat flight from Montreal to Fort Lauderdale, Fla., was forced to make an emergency landing Saturday morning due to reports of smoke in the cargo hold. Flight T942 took off from Montreal around 7:10 a.m. 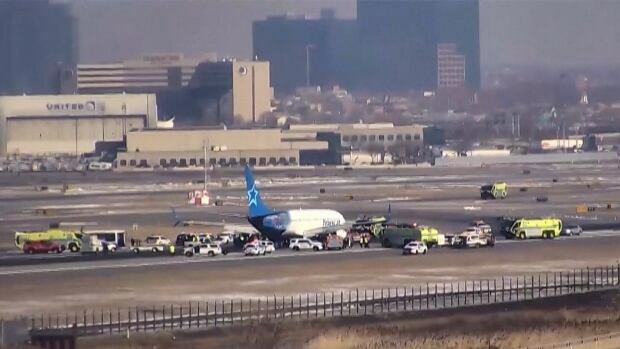 ET and landed safely in Newark, N.J., around 8:30 a.m. The 189 passengers made an emergency evacuation from the Boeing 737 plane soon after, said Air Transat spokesperson Debbie Cabana. Another plane will be sent to Newark shortly in order to continue the flight, she said. The Newark airport says two people sustained minor injuries, but that they were unrelated to the smoke. Flights in and out of Newark airport were halted for about 10 minutes but have since resumed.